The Electronic Music (EM) Lab affords students the opportunity to become skilled in electronic music production. 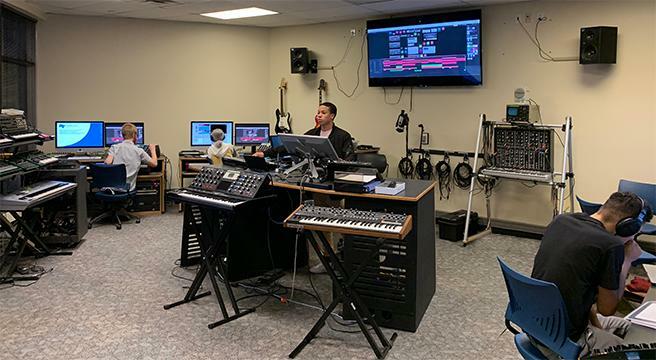 Courses that make use of this lab include Intro to MIDI and Sound Synthesis, MIDI Sequencing and Virtual Instruments, Ableton Live Production and Computer-based Scoring for Visual Media. The lab contains twelve identical student stations and an instructor's main station, each equipped with state-of-the-art hardware, industry-standard DAW software, and extensive pro-class virtual instruments and sound libraries from top vendors across the world used in today's music production. Every student workstation desk has a 27” iMac with 24GB RAM and an additional 27” monitor. A Yamaha MOXF8 synthesizer can be rolled out to serve as a multitimbral keyboard controller. A rackmount Moog Voyager analog synthesizer and an Ableton Push sit atop each desk. The rack beneath includes an Avid MBox Pro, Alesis mixer, MOTU MIDI interface and a patchbay for rerouting signals. Our primary DAW is Pro Tools, but Ableton Live and Reason are used in several courses. Virtual Instuments include Omnisphere 2, Keyscape, Stylus RMX, Trillian, Serum, MachFive, Ethno, EZDrummer, Superior Drummer, and Native Instruments Kontakt. Students will also have access to several other effects and processing plug-ins too numerous to list. EM Lab professors instruct while providing audio and video feeds to student workstations. EM Lab students have access to several instruments and controllers at their workstation as well as throughout the lab. EM Lab students have a plethora of electronic instruments to choose from. The only limits for EM Lab students are their own creativity.